Datalogic Gryphon I 4400: GD4430 - SCANNER ONLY. 2D Imager, USB/RS-232/Keyboard wedge/WE interfaces. Color: White. Does not include necessary cables or accessories. For the full kit see (Part# GD4430-WHK1S). The Datalogic Gryphon I GD4400-B 2D all-in-one imager blends advanced 2D decoding with motion sensing technology, producing a user-friendly device with outstanding performance. Featuring Datalogic's Motionix motion-sensing technology, the Gryphon I GD4400-B 2D imager senses the actions of the operator to automatically switch the device into handheld or presentation mode scanning. When picked up or set down, Motionix technology transitions the device seamlessly, eliminating the need to scan a label or rely on a mechanical switch. As an all-in-one device, the Gryphon I GD4400-B 2D scanner's permanent tilting stand is joined with an ergonomic handheld reader for handheld and presentation reading. 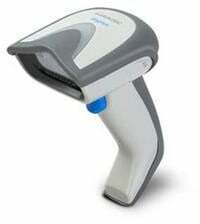 The all-in-one imager adjusts to any angle to fit individual scanning preferences. The cable connection is positioned well above the counter to avoid damage caused by spills. The Datalogic GD4430-WH is also known as Data Logic	DTL-GD4430-WH	or GD4430WH	.